Did you notice the collapse in corporate profits? 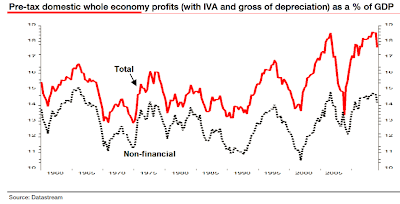 During the excitement of the downward revision of Q1 US GDP from +0.1% to -1.0% investors seem not to have noticed a $213bn, 10% annualised slump in the US Bureau of Economic Analysis’s (BEA) favoured measure of whole economy profits, defined as profits from current production. Also known as economic profits, the BEA makes adjustments to remove inventory profits (IVA) and to put depreciation on an economic instead of a tax basis (CCAdj). We show below the stark difference between the BEA’s calculation for post-tax headline profits (up 5.3% yoy) and economic profits (down 6.8% yoy). 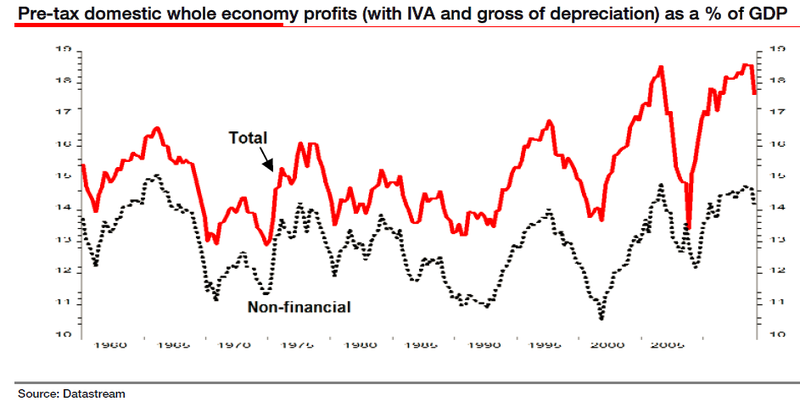 In this note we try to explain what is happening and why the 10% annual slump in economic profits really does matter. So headline reported profits are currently artificially inflated upwards to show a roughly 5% yoy increase, which is incidentally the same pace that the MSCI trailing reported stockmarket profits are rising by – both are misleading investors as to the underlying strength of profits. Thanks to Albert Edwards via Steen Jakobsen for the above charts. There is more in the report, including a discussion of why a renminbi (yuan) devaluation will crush US and European corporate profits. If I can get an online link I will post it. Here is a link to the 2014 Wine Country Conference Videos. Steen Jakobsen’s, Chris Martenson’s, and my presentation will be out later this week. 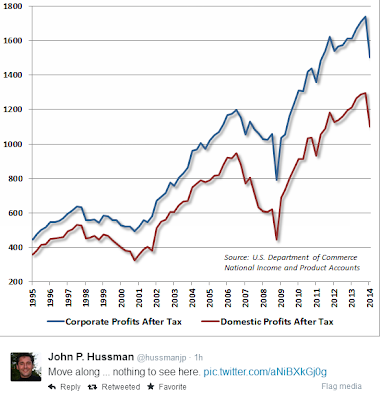 Inquiring minds should also take a look at Hussman’s post today, Market Peaks are a Process. John speaks of the Wine Country Conference Presentations and the cause. Here is John’s blurb on the cause. My hope is that if you appreciate the conference materials, you’ll consider making a donation – in any amount at all – to the Autism Society of America. The proceeds of the conference will go to support programs and chapters at the local level throughout the United States (we’ve also put up a $50,000 matching grant to encourage donations). I appreciate your generosity. More presentations are yet to come! And if you enjoyed the presentations (or even if you didn’t), please Make a Donation to the Autism Society. On behalf of John and the Autism Society, thanks to all who make donations. Any amount helps.